I've really been trying to add more bright colors to my wardrobe lately. I do have color in my wardrobe, but lately I've been noticing it is a lot of darker colors... like blue, purple, and green. I wanted to fix that since the weather is getting warmer. Recently, I was immediately drawn to the bright color of this coral sweater from Banana Republic while browsing online. It was the perfect addition to my spring wardrobe. There are some colors that I just associate with spring and coral is one of them. Here, I've dressed the coral sweater for work. (Apparently I'm in a work mode this week! Did you see Monday's post where I talked about transitioning a look between work and play?) This sweater is perfect for spring because it is a really great weight. It's perfect for those spring days where it's cold in the morning when you go to work and hot when you get home for the day. It comes in eight colors if you want some other options besides the coral. This coral sweater was perfect for a day at work with this black and white polka dot skirt. This skirt is actually a few years old. I've styled it before in this post in the fall. I love how the bright color of this sweater helps transition this skirt in between seasons! I know I will get a ton of use out of this sweater over the next few months. It will look great with blue jeans, white jeans, patterned shorts, and more! Banana Republic is one of my favorite stores to get clothing that is appropriate for work and also for special occasions. One of my favorite dresses that I wear to weddings is from Banana Republic, actually! Banana Republic's new collection is seriously amazing. You must check it out if you haven't already!I personally love this colorblock top and this jumpsuit. This post is sponsored by TRESemmé, a product of Unilever, as part of an Influencer Activation for Influence Central. Over the past few months, I have read quite a few articles about reverse washing your hair. Have you heard about it before? It is where you wash your hair first with conditioner and then with shampoo! Did you know that using conditioner after you shampoo your hair can actually weigh your hair down and leave it flat? Once I heard that, I knew I had to try it out. The verdict? I LOVE it! I tried out reverse washing with the TRESemmé Beauty-Full Volume System. Reverse washing doesn't work with any shampoo and conditioner, TRESemmé specially formulated these products to work this way! 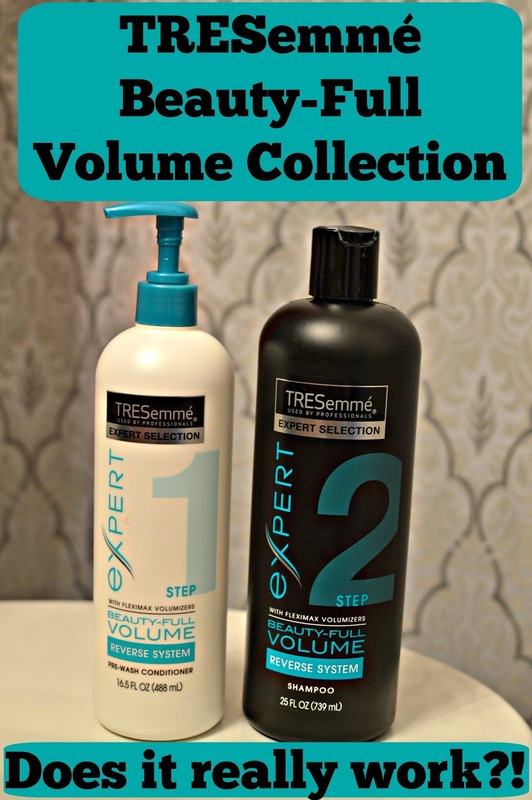 I have loved TRESemmé products for years. (Seriously, I think I've been using their heat protectant for like eight years!) This is such a good system. First, I wash my hair with the TRESemmé Beauty-Full Volume Pre-Wash Conditioner. This conditioner leaves my hair incredibly soft and helps remove any tangles in my hair. Then, I follow up with the shampoo. This reverse system helps achieve volume and softness at the same time. The first time I used these two products together, I was completely amazed at the results I saw. This TRESemmé system gives my hair volume. It honestly works better than some higher end volume shampoos I have tried in the past. Once I am out of the shower, I will follow up with the Beauty-Full Volume Touchable Bounce Mousse or the Beauty-Full Volume Hair Maximizer. I kind of switch it up just based on my mood, but either is a great choice for something to apply to your hair before blow drying. I really love the mousse, as it is easy to work with and does not leave my hair crunchy. The mousse gives me incredible volume and leaves hair feeling soft. However, since I think more people are familiar with mousse, I thought I would demo the Beauty-Full Volume Hair Maximizer today! I will first apply the maximizer to my hair and work it from root to tip. Then, I will brush through it with my wet brush. (If you don't have one of these... you need one! It's a game changer.) This product smells sooo good, too. You are supposed to blow dry your hair right after applying, but honestly I hate blow drying my hair ahah! I will normally take a hair break and do my makeup and anything else I need to get ready as my hair dries. Then, I will blow dry whatever hasn't dried yet. For today's post, I just straightened the ends of my hair. I wanted to show how much volume these products added to my hair with minimal styling.I finished up the look with the Beauty-Full Volume Flexible Finish Hairspray. This hair spray locks in my look and keeps my hair from falling flat. Above is the final product! I did not do any additional styling to my hair besides just running a straightener over the ends of my hair. If you pay attention to my roots, you can see that they are lifted and definitely have volume! This collection gives me amazing volume, no teasing required. I truly do get more volume from using these products together than any other products I have tried in the past. The concept of using a conditioner first is seriously genius, and I only wish I had started doing so earlier! My hair feels amazing and looks fuller. I honestly think that it is improving my hair over time, because the more I use it the more I feel like my hair improves in both volume and shine. TRESemmé's new Beauty-Full Volume Collection revolutionizes the way we care for our hair by reversing the hair-washing process we've used all our lives. If you have been curious about this process like I was, I highly recommend you give it a shot! Want to see these products in use? Check out the video below sharing how Chrissy Teigen gets soft, touchable volume using these products! Overall, this has made my hair very soft and given it more body. By now you all know that I love wearing my white denim year round. I know not everyone agrees, but I really love wearing them in the winter. 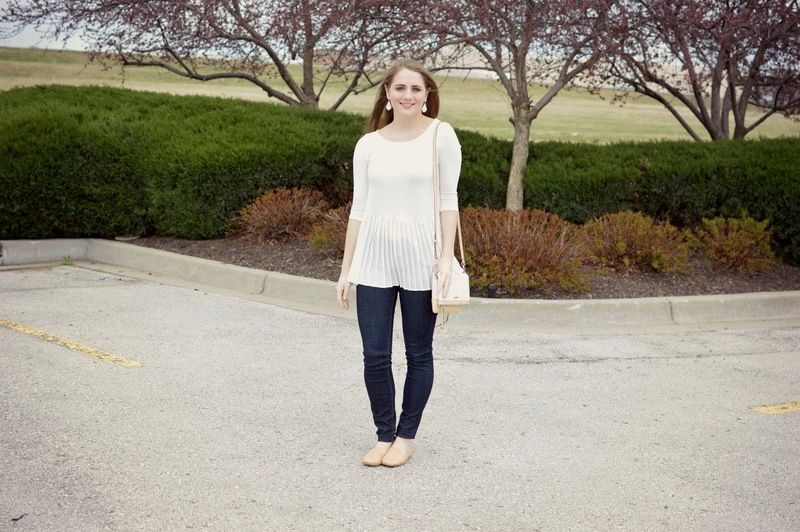 However, now it's spring so I think we can all get behind the love for white jeans, haha! This is the outfit I wore for running errands on Sunday with Tyler. It was the first day of spring but it was pretty chilly here in KC, so I opted for layers. 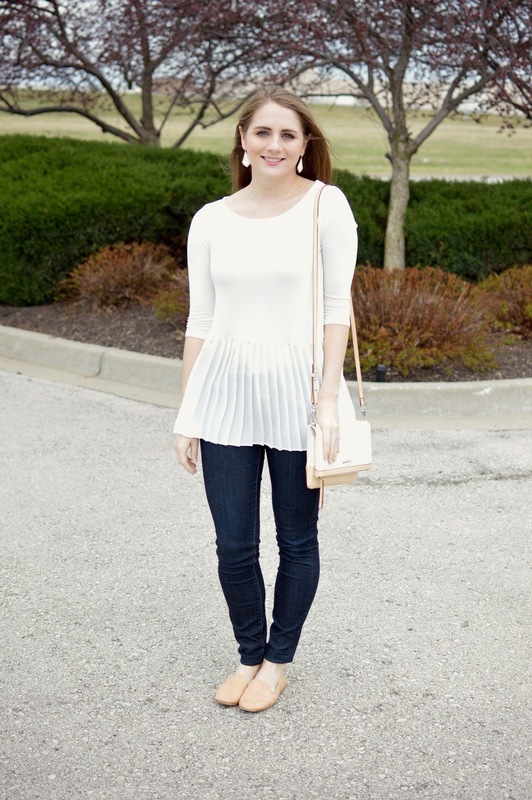 Have you entered my giveaway with Stella and Dot? Enter below! Happy Friday! 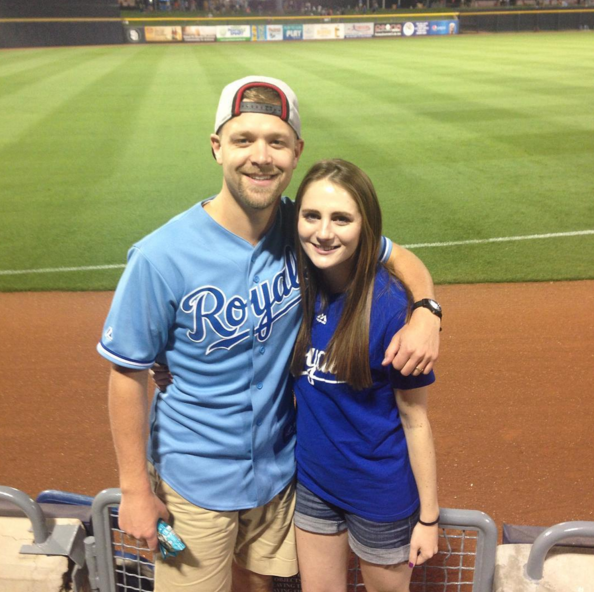 Today's blog post is a little different than my normal posts, but today I am sharing some of my current favorites or things I am looking forward too! 2. Smoothie bowls. I had my first smoothie bowl while in Phoenix for that work trip and it was seriously love at first bite. (I went back 2 days later and got another one haha!) I want to try to make them at home now, so if you have a favorite recipe please leave it in the comments. 3. Jana Kramer's "Thirty One" CD. My mom gave me this cd for my birthday and I am still in love with it. I pretty much always love country music, but once it starts warming up I feel like I listen to it non-stop. I just associate country music with summer. My favorite songs are "Love" and "Dance in the Rain". 4.Claudia Sulewski. I've been looking for a new Youtuber to add to my "watch list" for awhile now and recently stumbled across Claudia's channel! She's been around for awhile so I don't know how I never heard of her before, but I really love her content. She has great makeup tutorials, really creative editing, and a fun personality. Her night routine is so creative and is really well edited. I highly recommend you take a look! 5. Spring clothing. I cannot get enough of spring clothing lately. I'm trying to limit myself and not buy too much. However, I just made $65 from Plato's Closet yesterday so I'm thinking I need to treat myself ;). Below are some of the current pieces that I've got my eyes on! Lastly, I am giving away an All For Color Shift dress! Enter using the rafflecopter below. If you are subscribed to my YouTube channel, you would have recently seen this striped dress in a haul. I picked it up at the beginning of March and was just as in love with it when it arrived as I was when I was stalking it online! It is a cotton material so it is super comfy and travels really well. I took it to Phoenix and to Omaha last weekend and it looks great when you pull it out of a suitcase. This is a huge plus for me because I strongly dislike ironing haha. Unfortunately, this dress has sold out but I still linked it above in case they restock it. This dress is from the same brand and seems to have a similar fit. It is a solid color instead of the stripes but I still really like it! If you are looking for a cute dress for Easter, this would be a great option as it is less than $75 (currently on sale for less than $50). Also, I recently just picked up these sandals and I'm beyond obsessed. They are soo comfy. I wore them both Saturday and Sunday this past weekend and my feet didn't hurt at all. The website says they are true to size but I had to go up 1/2 a size in these. Before you go, don't forget to enter to win this All for Color dress!